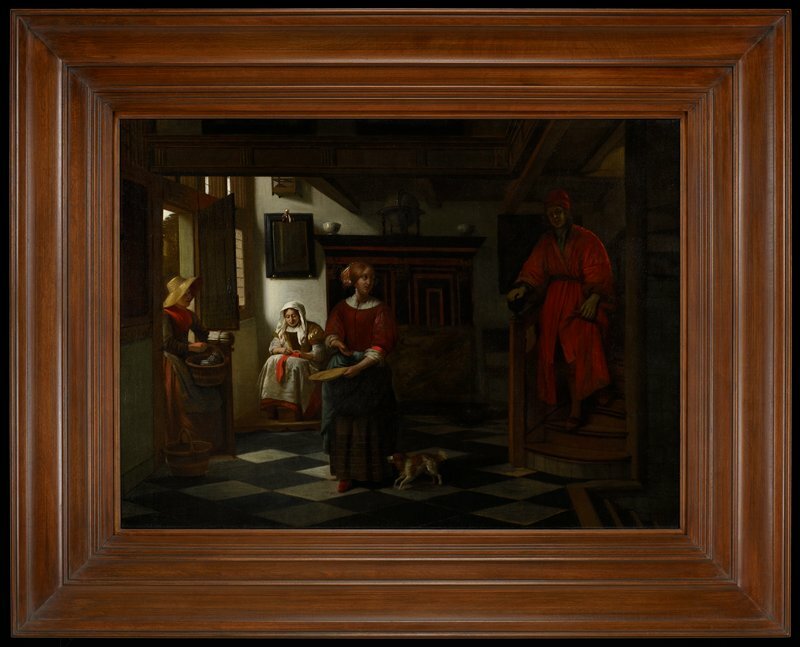 Pieter de Hooch’s clients preferred contemporary domestic scenes, which expressed the values of an increasingly prosperous Dutch middle class. In this picture, the family’s wealth is reflected in several details. The mistress of the house, outfitted in fine fabrics and baroque pearls, welcomes a shopkeeper delivering fresh white asparagus—always a delicacy. She turns to speak to her husband, dressed in a rich red kimono—visual evidence of the Dutch East India Trading Company’s access to Japanese culture. Note also the large kast, or wardrobe, draped with a sheet to protect the fine furniture from scratches.